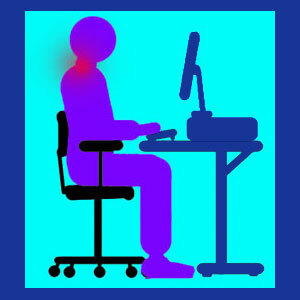 Neck pain sitting is an uncomfortable expression of symptoms often experienced in relation to working. Seated posture is not known to aggravate most forms of neck ache, but in some instances, sitting can do just that. Unfortunately, there is universal reason why this occurs. In some patients, there may be purely anatomical reasons why sitting, in some forms, or all, causes symptoms to begin or worsen. In other patients, there may be conditioned responses to blame or purely psychoemotional contributors which may relate to the circumstances in which sitting occurs and therefore instigates the painful suffering. This essay will explore neck pain in association with seated posture, particularly during work. We will detail the reasons for symptoms to occur and how a patient may be able to reduce the severity and frequency of seated neck ache. Even the actual expressions of seated neck pain can vary greatly from patient to patient. For many, sitting makes the neck stiff and tense, especially if the position is held for a long time period. Other patients get severe acute pain on one side of the neck or experience upper neck pain often in combination with a headache. However, the most common expression involves lower neck and upper back symptoms which occur right at the point where the spine curves to accommodate the change of posture due to sitting. There are many possible and plausible explanations for seated neck ache. The cause of the symptoms is likely to be very case-specific and may relate to obvious or obscure aspects of the patient’s individualized symptomology. Patients may have structural issues in the cervical spine which suffer an escalation of severity when placed into a seated position. 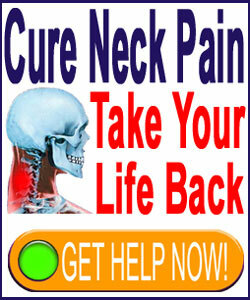 This can occur with arthritis neck pain or herniated discs in most instances. However, abnormal spinal curvature or vertebral misalignment issues may also react negatively from sitting down. Patients may have soft tissue pathologies responsible for neck ache when seated. These can be due to injury, muscle imbalance, repetitive strain or many other possible reasons. Soft tissues will generally cause the types of neck symptoms often seen in activity-related pain syndromes. Conditioning, also known as programming, is a lesser considered causation of many activity-related pain conditions. Patients get symptoms when seated early on in their suffering and associate the position with pain. It is no surprise that the symptoms now commence whenever the activity is undertaken. Psychosomatic neck pain is often related to the sensitive emotions of work or responsibility. No wonder that so many patients who must sit to work suddenly develop chronic neck ache when seated each and every day. In other cases, pain when driving, or dealing with other responsibilities related to sensitized or repressed emotions, can cause similar pain expressions. Treatment for sitting neck pain ranges considerable in form and effectiveness. Some patients attack the problem head-on and simply refuse to sit. Sounds crazy, but it can work. Personally, sitting is my bane and is always a task which causes me horrible pain in my low back and more recently, in my neck, as well. I rarely sit for long. I work at my desk standing all day. It is torture. Some patients choose to get a new chair or some variety of cushion or massage device to help them better cope with sitting. Results here range the full gamut. Some people find that a nice ergonomic chair can provide lots of relief. Some patients love their massage cushions. Others find them to be a complete waste of time and money. The only way to know is to try. Just don’t place too much faith in any product’s ability to actually cure pain. If you can achieve symptom reduction, you are already very lucky.